Chakkaphong Road is the main road located at the western end of Khao San Road. Turn left from the western end of Khao San Road and your destination is a 200-meter walk. 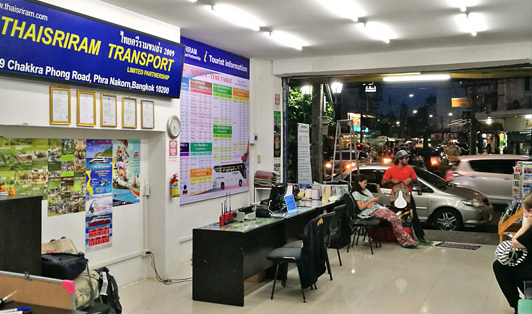 This road is a departure point for minivans going to Kanchanaburi and several bus trips provided by Thai Sriram, a bus company running the main routes from Bangkok to Koh Samui, Koh Phangan, and Chiang Mai.